To mark International Women’s Day, two female masters talk about their roles in one of the City’s oldest traditions. The livery companies of London represent a unique collection of trade and craft associations. City‘s links to the City of London date back to 1894, when the Earl of Northampton set up the Northampton Institute to promote industrial skills, with the backing of various London livery companies. Felicity Harding, master of The Worshipful Company of Spectacle Makers and Susan Fey, master of The Worshipful Company of Educators, who were elected last year, both agree that there are positive changes happening to the nature of the livery companies. Tell us a bit about your Worshipful Company? Susan: We started in 2002 and we follow all the traditions of the livery companies. We use the term ‘educator’ rather than ‘teacher’, as ‘teacher’ can be quite narrow and we represent the whole professional sector. Our membership is representative of our trade as we have all kinds of people from different backgrounds. We promote education and celebrate the profession of educators through our charities. We also have social interest groups and have formed special needs for music, cultural and military education. We host our own discussion evenings where we talk about the education profession and hold debates on the reforms of education and practical skills. Felicity: We are the Worshipful Company for spectacle makers. We are an ancient company, as we date back to 1629 and I am the third woman to work in this role. As a company we work in three main areas. One is to support the City of London and that can be from working on a variety of events or with the Lord Mayor and their charities. The second is our educational craft where we offer diplomas and examinations. The third is working with our own charities to ensure that we can support our students and vision impairment charities. Women have always been involved in the production of spectacle making. We have had women taking exams since 1898 and performing sight tests since the 1900s. 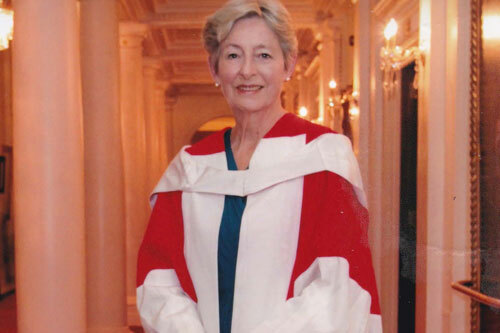 As a master of a Worshipful Company, what do you do on a daily basis? Susan: The days can be so different. A few weeks ago I went to Arsenal Football Club to present at their community hub. The next day I was at New College Oxford giving a talk about higher education. So it really is a flexible role! The role of master is like being a chairman of the board, we are responsible for the committees, courts and finances. I attend a lot of meetings, lecturers and events about education. I am always on the lookout for partnerships with other organisations to increase our reach. Everything we do is voluntary and it can be hard work, but we all do it as we feel passionate about education. Felicity: A typical day for me could involve a wide range of meetings with optical bodies, committees, charities, our students and colleagues. We are not a closed company and value support from people of all kinds of backgrounds, so I work with a wide variety of people. One of the most exciting things is getting to meet amazing people who work in the optical fields. Felicity: First of all you have to have the Freedom of the City of London. Then to become a liveryman people must sponsor you. Anyone can apply for this from whatever background. I had met a lot of people in the field from my work in the charity sector. Once I became a liveryman I was invited to a lot of events where I became more familiar with the company and sector. I was then voted in to the position of master by my colleagues. The voting process looks at the skills of what the person can offer. Susan: If you have demonstrated a strong ability in the field then you are eligible for nomination. You are then nominated by board members and the winners are voted in. You start off as a lower warden and progress to middle warden, upper warden and then eventually master should you be voted in. 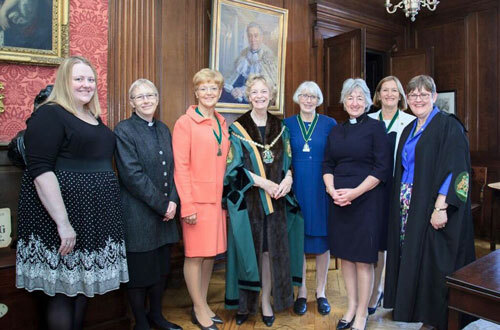 How uncommon is it for a woman to be a master of a Worshipful Company? Susan: Not very common, but it is getting better. I think this is due to the older companies realising what century we are in. I am the third lady master of my company. The next two masters will also be women. I was told when I became master, that in 800 years of the livery I was the 123rd female master. There are a lot more modern companies coming forward, who are not held back by the boundaries that we have seen throughout history. Felicity: Spectacle making has always been ahead of the game, as we have had three female masters in the past and women have always played a role in our craft. Women are becoming more of a significant presence in the worshipful companies. There were 18 lady masters in 2018, and there are a lot of women in the courts who will become masters in time. There is even enough of us to form a lady masters association, and perhaps one day we will. Nearly all the male masters are identifying that women need to be included in their court. There cannot be a glass ceiling, and we need to make sure people have the same opportunities. What do you think needs to be done to ensure that more women have the same opportunities as men in Worshipful Companies? Susan: I have not come across any problems in my company, but it may be prevalent in other companies. In certain areas, it can be very male dominated. If you go to most events, then the bulk of the audience will be white male. There is still quite a lot of change that needs to happen and I think the way that change happens is for women to put themselves forward more and not take “no” for an answer. Felicity: I know they do in my company and we have always worked hard to ensure that this is the case. We also look at promoting diversity and inclusion, and many of our people come from all over the world. We have a wide representation, but one area that we struggle in is attracting younger people. It is very difficult for these people as they have so many responsibilities such as setting up their careers, finding accommodation or starting families. What advice would you give to women who want to get involved in Worshipful Companies? Susan: Throw yourself into it. Don’t spend too much time thinking about men taking everything and take it yourself! Look for a company which represents your trade or profession. Research them and talk to them so that you have some context. If it means a lot to you, then look into their gender balance too. Women need to put themselves into those positions and say that they want them. Felicity: Go and have a look on our website, see what we do. Don’t be afraid to talk to us, call us and ask any questions that you have. You have nothing to lose. If you know a member, ask them to take you along to our events and see if it appeals to you. I found Dr Christine Tomkins, who was the second female master of spectacle making, incredibly inspirational. I hope that women will always feel inspired to join this wonderful tradition. Felicity: It reminds me of when I worked in a charity with other women in Africa. There I saw the world of women beginning to develop their skills through educating and being educated. It was giving those women the ability to deliver optical services in their own countries and communities. Women have provided such a high level of optical care around the world. We need to keep ensuring that everyone has the same opportunities and this is a day to celebrate this. Susan: For me, it is about the work that women do in less prosperous countries, as it has the international title. What some women have to put up with in some parts of the world is unbelievable. I think this day is about promoting their success and achievements.